Happy New Year friends! I hope you all had a good start to the year, whatever you were doing (I was in Geneva getting soaked – the heavens opened just before midnight! ), and 2018 is an amazing one for every single one of you. Today I wanted to post my final photo an hour of 2017 before we get too far into January! I actually almost missed it, but luckily I was browsing through Twitter in the morning and saw other people doing it, so I waited until the next full hour and then started mine. As always, I am linking up with Louisa and Jane. 1 p.m. Showered and now getting dressed. 2 p.m. In town in the rain – I had gone to track down a last-minute Christmas gift. 3 p.m. Just managed to leap on a tram before it left. Phew! 4 p.m. Home, drying out with tea and candles. 5 p.m. Cross stitching away. 6 p.m. 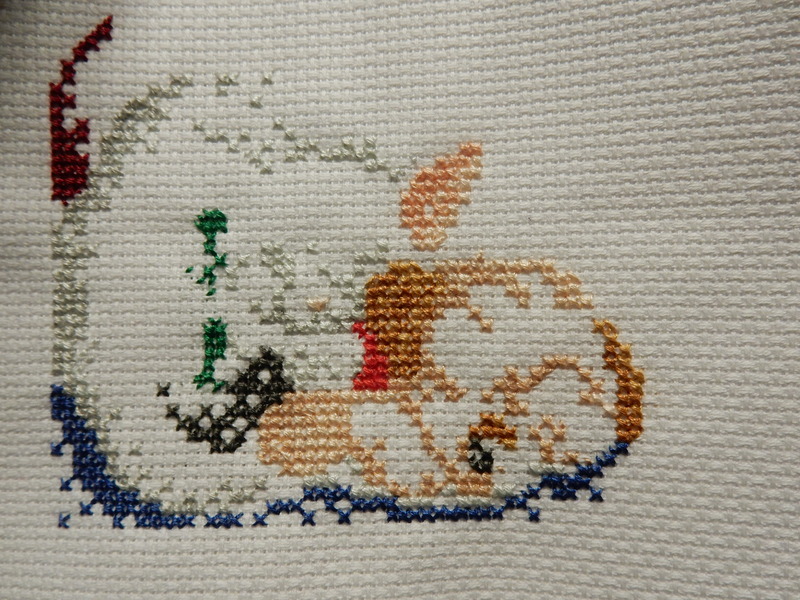 Still stitching… thus far it looks like nothing! 8 p.m. Jan put on “Being John Malkovich” while we ate. 9 p.m. Still watching. How messed up is this film?! 10 p.m. Film over, time for a hot chocolate. And when we switched the DVD off Home Alone 2 was on German TV. The next Photo an Hour is on 20 January 2018. If you want to join in, all you have to do is take a photo every hour and then either upload them to Twitter or Instagram on the day using the #Photoanhour hashtag or save them and write a blog post like this one afterwards. Or you can do both (I usually take part on Twitter and then write a blog post later). Any favourites here? Personally I like the “Santa stop here” one, because although it’s simple it’s effective. And I think the JOY one came out well too. Apologies for the quality of the photos. 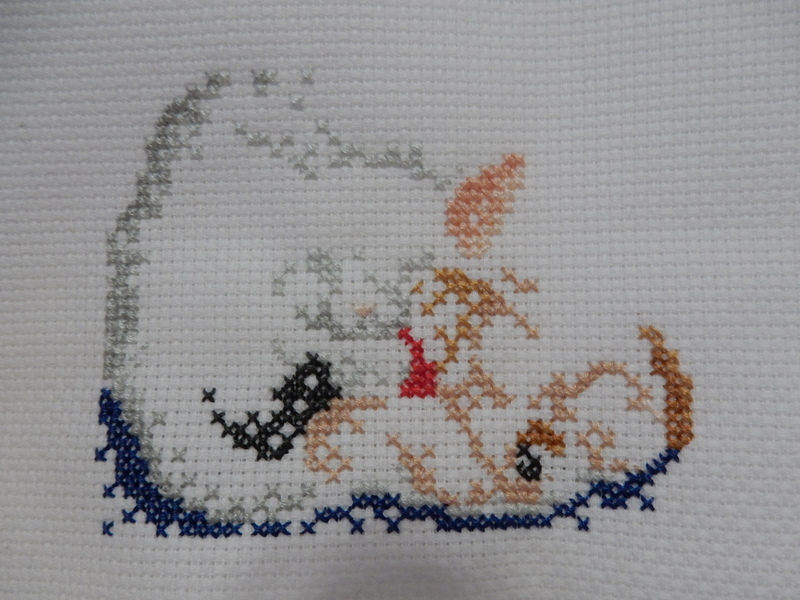 One day I will figure out how to take good pictures of cross stitch! I should really do another travel post to try and catch up, but the thought of sorting out all those photos just makes me feel tired, so instead here is some of the Christmas stitching I’ve done so far this year. All of these will be made into cards. Do you have any favourites among these? Personally I love the snowman most, although I do also like the bauble in the “JOY”. Zoe‘s initial thought was “It’s a hippo building a rocking horse (ok, more likely a polar bear given the context but it looks like a hippo here)”, but then she changed her mind after seeing Becster‘s guess: “It’s a Moomin and it’s creepy red haired friend riding a horse!” – I love both of these ideas and can certainly see where their coming from with the Moomin! Katrin said “The ghost has a teddy bear in his hands now.” – you may remember that she had previously guessed a squirrel and a ghost on a sleigh. Kezzie guessed “It’s a big pile of animals! That’s a rabbit in the middle!x” This is… interesting 😉 No more shall be said for now. Elaine said “Oh dear, I am confused now. I can’t decide if it’s a rabbit or a reindeer! I think there might be lots of silver sparkles flowing out from the back of the creature’s head.” Reindeers… rabbits… Hmmm. Constance guessed that it’s “a hippo on a sleigh with a present in the front!”. Great guess – I can see the hippo too! Meredith said: “I really can’t tell! All I see are vague outlines of animals – a squirrel, a reindeer, possibly a friendly penguin…” LOL, sorry. I picked a difficult one this year. And finally, NancyTex said “Well, clearly this is a white horse (possibly a unicorn), seated upright and carrying a black clutch purse, whilst blowing out the flame of an oil lamp. (On a magic carpet).” – This sounds amazing and I really want to stitch it now. Someone design it for me please? Have fun! If nobody gets it this round I’ll put up a new picture next week or something. Guesses in the comments, as always. Are you all sick of hearing about my cross stitched Christmas cards yet? I’m certainly sick of the sight of them! Luckily I’m all done now and this will be my last post about them (for this year, at least). I must apologise for the quality of some of the photos – I have no idea why I find it so difficult to get Jan’s camera to work for me! At this point I’m pretty sure it just hates me! I took two photos of that card and the above turned out best… so you can imagine how terrible the other one was! I liked the little snowman so much that I decided to stitch him a friend! This is actually among my favourites of the cards I made, along with the bah humbug one. I just love the pretty snowflake paper I used for the background. Don’t worry, I’m not going to go into detail about all the cards I made. Here’s a selection of photos of the rest. There are more, but I think that’s enough for one post! I think he turned out quite well 🙂 Mr snowman is now all wrapped up and on his way to my grandma, who will hopefully love him lots and give him a happy home! 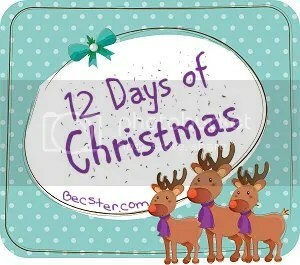 I’m linking this up to day 7 of Becster’s 12 Days of Christmas, which was Christmas crafts. I don’t think I’ve done this many crafts at Christmas ever, not even when I was a small child and we made decorations and things in school! I think the end products are worth all the effort though. My dad is known as the Scrooge in our family. He’s not really a Scrooge – he makes Christmas dinner every year (and even made me one in August once), buys thoughtful gifts and will happily play silly games after Christmas tea. But since my step-mum died on Christmas Eve, it’s understandably not his favourite holiday. For years, we didn’t even put the tree up, although now that my little brother is old enough to understand Christmas the house gets decorated again. So when I decided to cross stitch all my cards this year, I knew my dad’s couldn’t feature any of your run-of-the-mill festive designs. Instead, I designed and then stitched the picture below, and even though it’s pretty simple I have to admit I’m really proud of it! Now all I have to do is actually make it into a card.